Home » Blogs » How Much Does the Government Really Owe? How Much Does the Government Really Owe? When analyzing the fiscal health of the country, we often focus on federal government debt held by the public. Data published by USAFacts allows us to examine the government's balance sheet in a different way that provides alternative insight. While the government's largest direct liability is outstanding debt, that debt does not represent its only liability. The federal government also has a variety of pension and retiree health liabilities, for example. 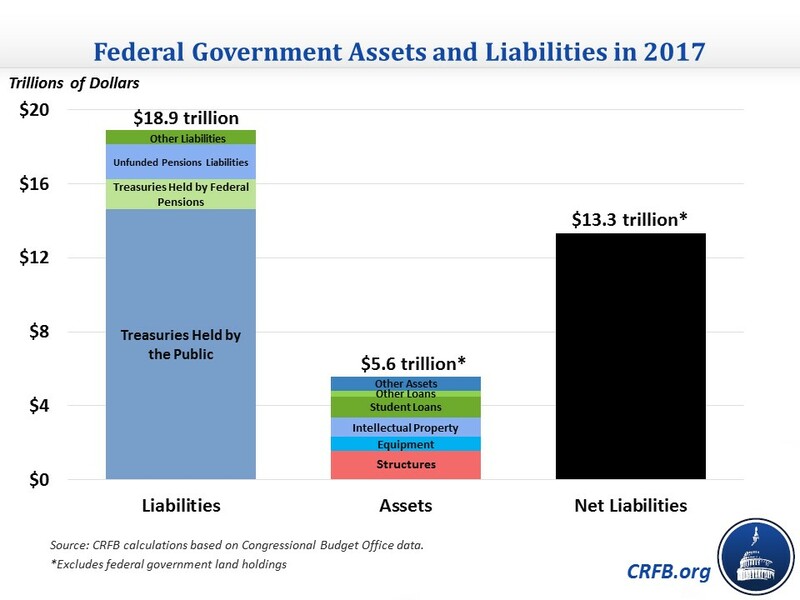 In total, USA Facts finds the federal government had $18.9 trillion of liabilities in 2017, significantly more than the $14.7 trillion of debt held by the public. Importantly, these estimates do not account for the roughly $50 trillion of implicit Social Security and Medicare liabilities the government would owe without adjustments to those programs. Of course, measuring gross liabilities alone offers an incomplete picture. In 2017, the federal government also held $2.2 trillion of financial assets (half in the form of student loans) and $3.4 trillion in non-financial non-land assets (buildings and other structures, equipment and, intellectual property). USAFacts shows the federal government owned $5.6 trillion in total non-land assets in 2017, resulting in net liabilities of $13.3 trillion. Thought of another way, in 2017 the federal government was $13.3 trillion – or 69 percent of GDP – underwater. Unfortunately, the government's net position has worsened over time. USAFacts shows its erosion clearly in nominal dollars, but it remains even when we convert the data to a measure relative to the economy (liabilities-to-GDP). In 1980, liabilities were not much larger than assets, resulting in net liabilities of only 13 percent of GDP. Net liabilities grew significantly in the 1980s and early 1990s, peaking at 41 percent of GDP in 1996. 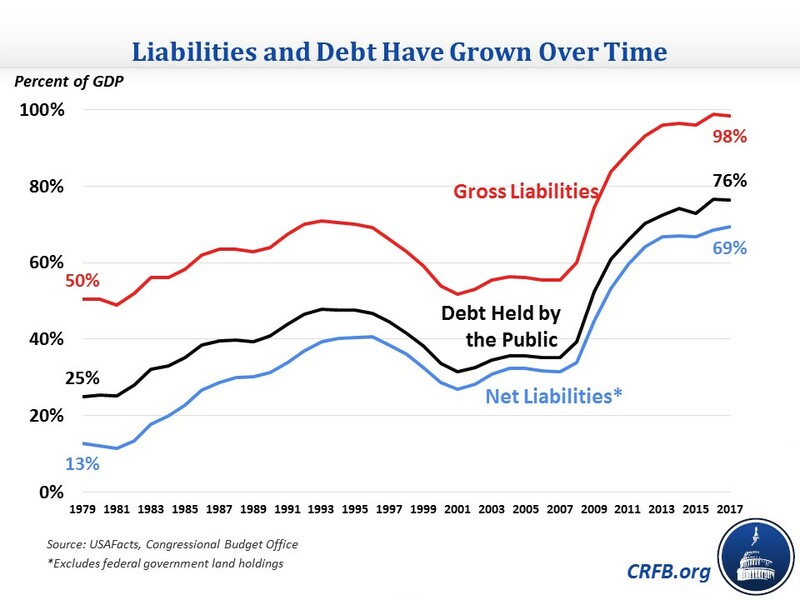 Though federal surpluses helped reduce net liabilities to 27 percent of GDP in 2001, they exploded over the course of the Great Recession, rising to nearly 70 percent of GDP. As debt grows, we expect net liabilities to continue rising. Importantly, even the figures above don't tell the whole story on government finances. As mentioned before, they do not account for the implicit liabilities accruing for Social Security and Medicare benefits. They also exclude land assets, don't fully account for the value of government-owned gold, and leave out the federal government's greatest asset – the U.S. economy (and tax base). Still, USAFacts does a huge service by bringing important information to the discussion over federal finances. Their website offers a treasure trove for other important fiscal and economic facts and figures that serves as a useful resource for any fact-based policy debate.